GET YOUR WORK DONE COMFORTABLY! SAY GOODBYE TO NECK PAIN AND TENSION FROM ALWAYS LOOKING DOWN AT YOUR LAPTOP! This desk is designed to allow you to set up an office anywhere! It is easy to carry, with a light weight aluminum frame. 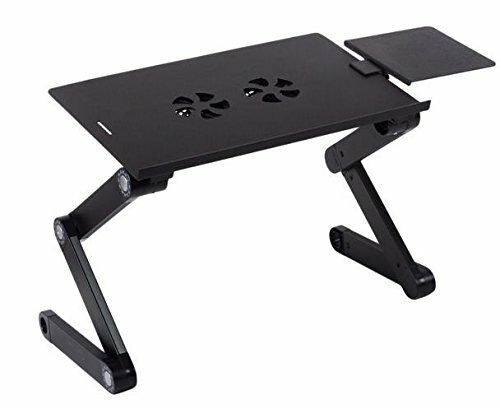 While this device makes a perfect desk for your laptop, it also has several other uses, including: - TV Dinner Tray -Sound Equipment Table -Projector Table -Standing Desk -Book Tray -Writing Desk -Tablet Holder -Standing Desk/Stand Up Desk Quickly plug up the USB cord and turn on the ultra-quiet cooling fans to chill things out! If you have any questions about this product by My Luxury Outlet, contact us by completing and submitting the form below. If you are looking for a specif part number, please include it with your message.